Руслана Панухник, директорка ГО «КиївПрайд». According to police, March of Equality “KyivPride-2017” was attended by 2,500 people, and according to the organizers – about 3,500. Not only walkers but also two cars participated for the first time thanks to Elton John Fund’s financial support. KyivPride events were attended by about 1,000 people. “In our opinion, this march was a step forward – not only because it was attended by twice as many people as last year, and not just because the March was widely covered in the media and we see that public support for LGBT increases, but also because the March was attended by more representatives of the LGBT community. 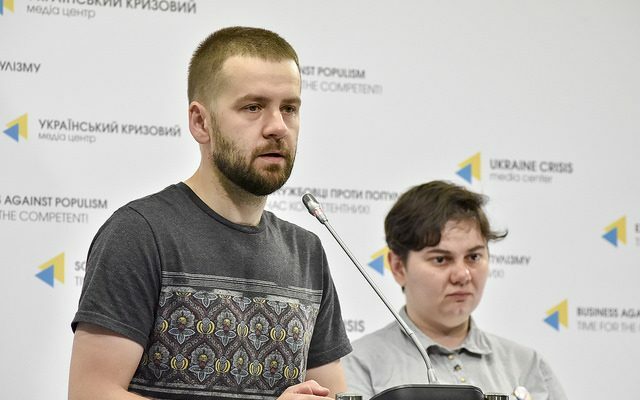 This means that people are no longer afraid to be themselves in public,” said Zorian Kis, Board member at the NGO “KyivPride”, at a press briefing at Ukraine Crisis Media Center. There were no clashes during the March. The March opponents (about 300-400 people) started to gather in Shevchenko Park in the evening with the intention to block the route, so at the last minute it was decided to choose an alternative route – along Tereschenkivska street. The opponents seized a bid rainbow flag and about 20 small flags but did not manage to break through to the column and attack the participants. Participants were attacked seven times 2-3 hours after the March. Ten people – nine men and a woman – were hurt during the incidents. According to organizers, these participants were intentionally followed. The opponents also attacked a Belarusian observer from the human rights organization “OZONE” (also after the March). Police used force against a media representative. The circumstances of this incident are being elaborated. The organizers noted that it is the first time they have faced information provocations both before the March and during it. They stressed that they did not manage to respond to each of them. “The Organizing Committee could not and did not plan to control or impose censorship during the March. I emphasize that the committee does not always agree with slogans that can be seen during the march. March of Equality is an open event, and any position that does not violate the law of Ukraine can be expressed during it. Security volunteers were instructed to ask people to remove the posters that call for violence or otherwise violate the law of Ukraine. This is our official position, and there will be no more comments on this topic,” noted Zorian Kis.